Allimax Pre-Pro - 100 Allicin - 60 Ct.
Allimax® Prepro™ is specifically designed for maximum benefit and contains the worlds finest enzymes. Plant protease, acid stable protease and bromelain which break down proteins to smaller chains of amino acids and individual amino acids - Amino acids are used by the body as building blocks. Cellulase for breaking down cellulose, xylan and beta glucan contained in many fruits and vegetables. Amylase for breaking down starch. Lipase for breaking down fat. Lactase for breaking down lactose (milk sugar) to glucose and galactose. Allimax® PrePro™ capsules sophisticated refinement allows us to capture garlic's active component, Allicin and deliver it to where the body needs it. 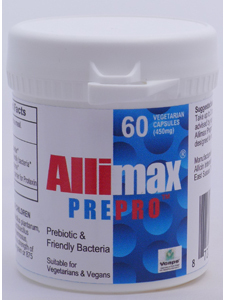 Allimax® PrePro™ capsules contain 200 mg. of stabilized Allisure® AC-23 allicin powder, a balanced blend of 5 probiotic strains that equal (5 active billion bacteria) 5 digestive enzymes and FOS a prebiotic. This means that PrePro™ can be used to help resolve a number of digestive conditions especially where the gut flora is in dysbiosis. Ingredients: Each bottle contains vegetarian 60 capsules with 200 mg of Allisure® AC-23 per capsule and 32 mg blend of 5 digestive enzymes (amylase, bromelain, lactase, lipase & cellulase), 118 mg blend of 8 probiotics (acidophilus, bifidum, helveticus, plantarum, salivarius, thermophilus, faecium & reuteri) and 25mg of FOS, a prebiotic in a 100% vegetarian capsule. Free of wheat, gluten, yeast, soy, artificial colors or flavors. Dosage: Up to 6 capsules per day may be taken if needed, and just one capsule a day of AlliMax® Pre-Pro™ with food can be beneficial for health and well-being. It is easily absorbed. Allimax Pre-Pro is worth every penny! I'm ashamed to admit that I RARELY write reviews; however, I read and rely on them when ordering products online. I have a very sensitive GI Tract, and finding the right combo of supplements for my health is tricky. I just placed my second order for 2 bottles of Pre-Pro because I can tell a HUGE difference in my overall health, with no side-effects at all (which is unusual)! I'm so grateful to have found out about Allimax - THANK YOU! I used to take Allimax capsules and then I found the Allimax PrePro capsules. These products are such a great deal. The bottle has 42 capsules, not the normal 30 like the other products. It has pre and pro biotics in it. I was able to consolidate some of my daily supplements and found a way to save some money. One a day has been a perfect amount to keep me on my toes. I have been taking this product for many years, because it is simply the Best Allicin product on the market today. I always have some in stock at my home, for the cold & flu season. Allimax PrePro is such a fantastic product. I was referred by my ND to get some of this and I have been using it for 3 plus years. Thank you for making something that has no lingering smell and works so great.